Guess what happens when you force employers to pay higher wages? They hire fewer workers and unemployment goes up. Carpe Diem blog. There’s plenty more at the link. Seattle’s city council made history in June 2014 by unanimously passing legislation that will eventually bring the city’s minimum wage up to $15 an hour, the highest in the nation. Washington State already had the distinction at that time of having the highest state minimum wage in the country at $9.32 an hour. 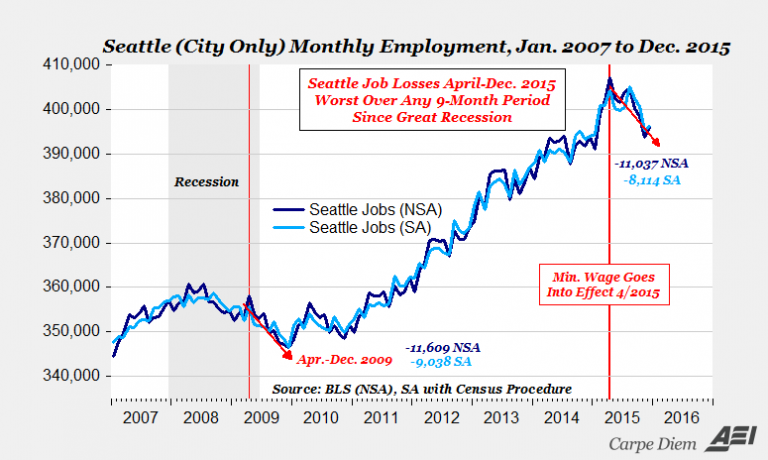 The first increase to $10 an hour for some Seattle businesses and $11 for others took place on April 1, 2015. Additional increases to $12.00, $12.50 or $13 an hour took effect for most employers on January 1, 2016. Further increases will continue until the city’s minimum wage reaches the full $15 an hour, which will happen on the first of the year in either 2017, 2018 or 2019 for most employers and as late as January 2021 for some small businesses with fewer than 500 employees.